Key messages, you’d think, would be carefully thought out before they go into public view. Driving into work one recent morning I was following a van that proclaimed proudly “Fast Response Services”. Laudable, I thought, are these services anything I might want, like plumbing or boilers or cars? But nowhere on the van was there anything that said what KIND of services they offered (and with the state of traffic on the ring road I sat stationary behind, and then next, to it for long enough to examine it closely). The only other context was their company name (no help) and a logo which looked vaguely house shaped. You see it all the time on vans when you look. Next time you’re in a traffic jam or a car passenger try to guess what business the people in the vans are in – could be a new family game to rival pub cricket! Maybe if someone recognised the business name they would know what it meant, but really, why bother putting anything on your van at all if it doesn’t promote your business? Drivign towards one of Nottingham University’s campuses I pass a building with the sign “Colour Services” – another one that always has me thinking. Is it paint? Graphic design? Car re-sprays (nearly everything else on that part of the road is to do with cars)? That logo on the van this morning looked like a house with a wavy line – perhaps they were services helping in the event of flood or other water emergencies? The graphics gave me a hint – graphics are always good if they help to explain. In this case, still not enough. Marks are now available for collection via the coursework collection trays in [Redacted name of School]. I could see that it was from one of the School administrators, but that was all the help I got as to context. Private messages in Moodle are like text messages in that they don’t have a context (no subject line, or indication of what module it was sent from). Apart from the name of the person who sent it, the only clue you have as to its meaning is its actual content. I expect students would have been able to remember in which of their modules they had recently done a marked piece of coursework, and maybe that’s so obvious it doesn’t need any further context. Private messages like this are also easy to ignore and students (and staff) can easily ignore or turn them off. In this case, sending the message via Announcements would have given the students the name of – and a link back to – the module, and the module convenor the reassurance that it went into all email boxes and couldn’t be turned off (but might still be ignored!). Like the flyers for events which forget to mention the date, meeting requests which don’t specify a room, or the emails without a subject, these things happen all the time. It got me thinking about whether I was really getting the message across. I’m currently writing a training module for those with administrative responsibilities for Moodle across the University, and I can see that I have peppered the module with long-winded text-heavy explanations that my learners are not going to read, let alone understand! Like the logo on the van, graphics can help a lot – but they can take a long time to create or source when you’re writing learning materials – or blogs. 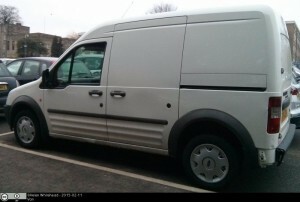 It took a ridiculous amount of time to source a copyright-free picture of a van for this blog piece! (In the end I took my own pic and uploaded it to Xpert, so you too now have access to a copyright licensed picture of a white van!) Another source of copyright-free images is Morguefile. What can really help is a new viewpoint. I’ll try my materials on someone else first. And when I’m developing my materials I’ll try to remember how I felt when looking at that van – what IS the actual message this is supposed to convey?